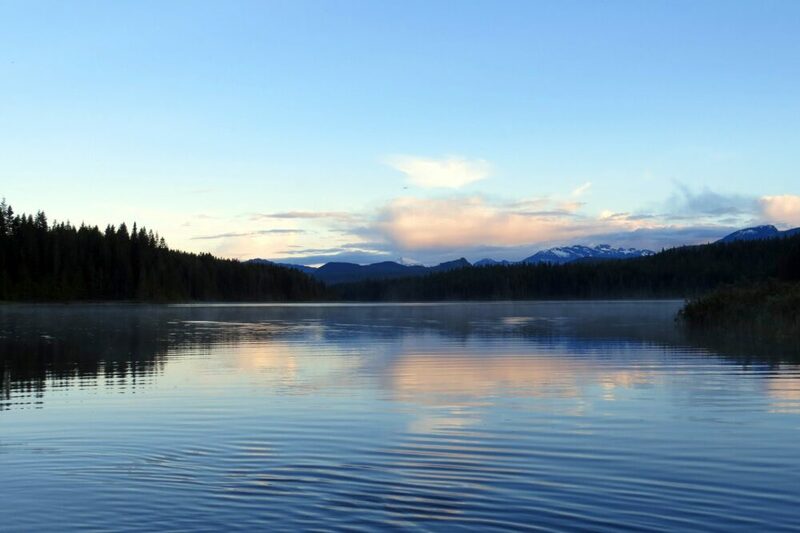 Hidden in the Sayward Forest to the north-west of Campbell River, there are dozens and dozens of lakes. Twelve of these lakes happen to align and connect with other waterways to form a convenient oval. This is the basis of the Sayward Forest Canoe Circuit (or Route). Not just for canoes, this route is perfect for a three to five day paddling adventure. 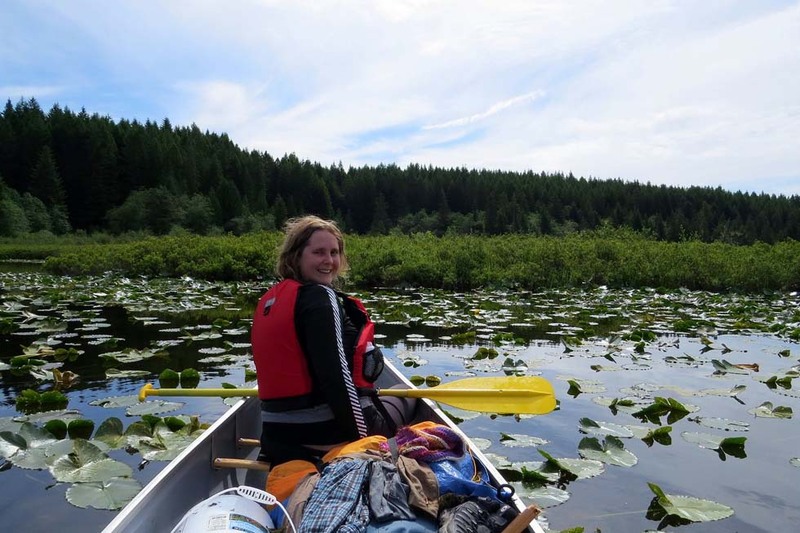 The Sayward Forest provides a variety of paddling experiences from long, narrow lakes to short river sections and tiny ponds. Conditions are often calm, creating a beautiful mirror lake effect on the best days. Surrounded by lush temperate rainforest (with a few patches of old growth), some lakes have views of densely forested hills with the odd mountain looming behind. 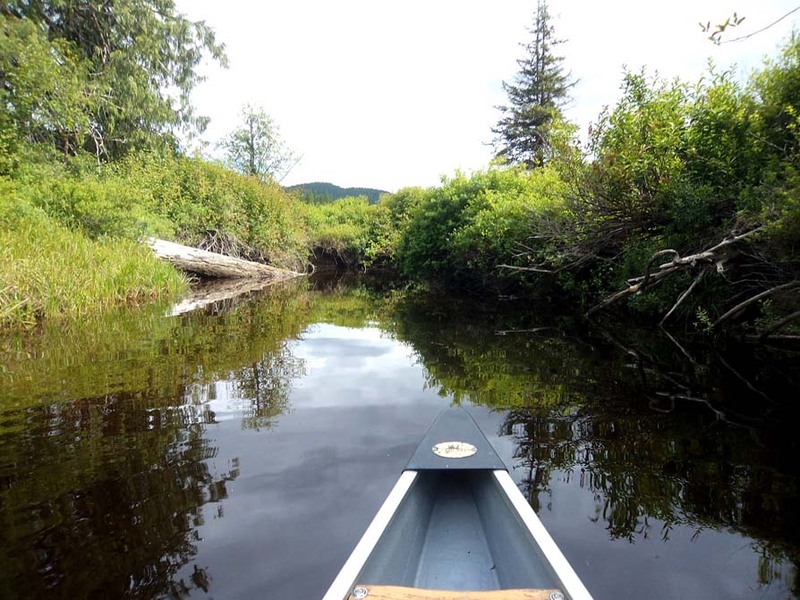 Read on for a complete guide to paddling the Sayward Forest Canoe Circuit. 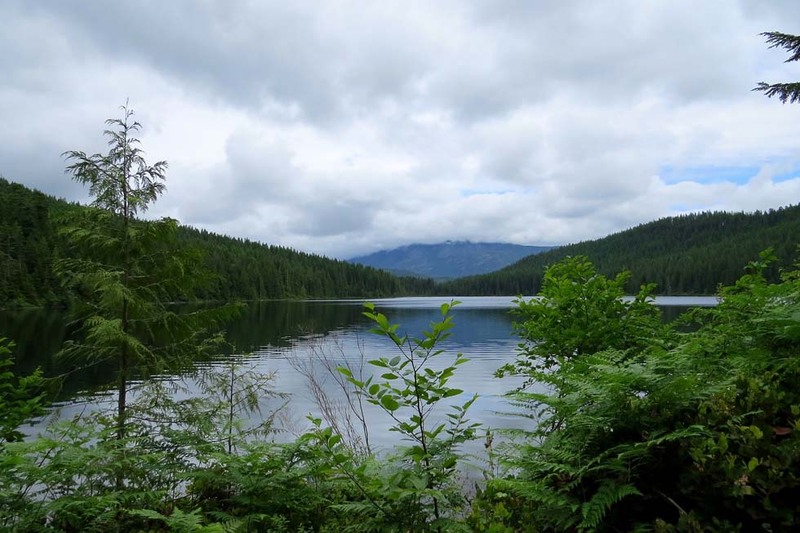 Despite the easy access and amount of recreation opportunities as well as logging activity in the area, there is a surprising wilderness feel about the Sayward Forest. Indeed, while on the lakes we heard nothing from any of the roads or commercial campgrounds. While camping at night, we enjoyed the silence and array of stars, only interrupted by the occasional loon call. We paddled the circuit mid-week in late June, and found ourselves paddling and camping alone, seeing only a handful of people total over the four days. With beautiful views, well maintained facilities, a convenient location and just the right amount of challenge, the Sayward Canoe Circuit is a great choice for a paddling trip for novices and veterans alike. 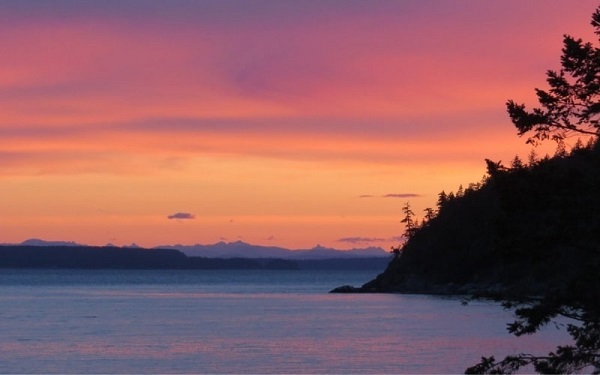 It’s a unique Vancouver Island paddling experience to rival other canoe trip experiences in British Columbia. Our adventure started at Apple Point Recreational Site at the southern end of Brewster Lake. We had planned our trip around available time, the weather and our own lake priorities. Heading out late on Tuesday after Jean Robert had finished work, we knew that we couldn’t expect to go too far the first day. We instead aimed to have a very long day Wednesday to get a good portion of the circuit completed by Thursday, when rain was due. The southern lakes are more road accessible and we had paddled some of them before (Fry Lake and the lower half of Mohun), so we prioritised spending time on the northern half of the circuit. This route also left the longest portage, 2.2km, for the last day when we would have less food to carry. It is recommended to travel counter clockwise due to the short river sections on the route. 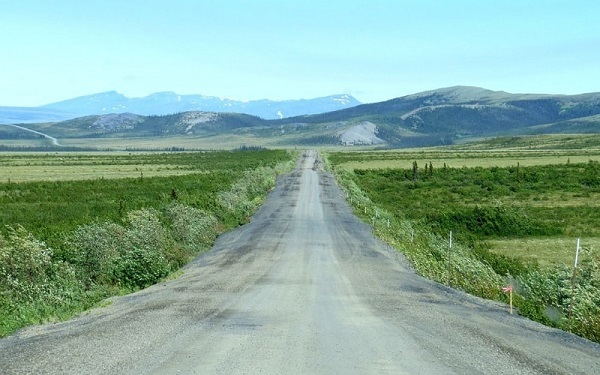 Neither of us had ever done any kind of multi-day outdoor adventure involving a different destination every day and a set route like this, so it was all pretty brand new and exciting for us. The Sayward Canoe Route lived up to our expectations and more. The experience wasn’t exactly a piece of cake for us but we had an awesome time none withstanding. Each lake was just a little bit different, with something new to look at around every corner. 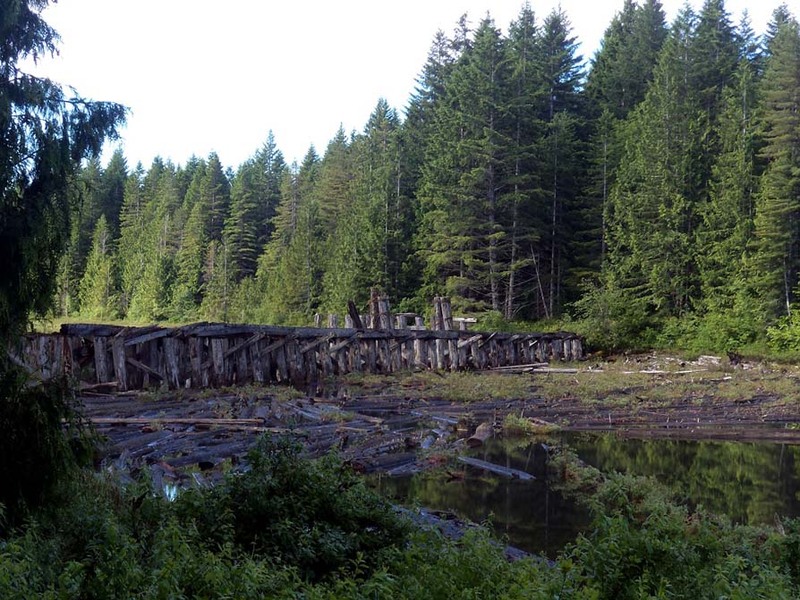 A new mountain, an island, an old railway trestle, a beaver dam in our intended path….nothing is predictable on the Sayward Circuit! The portages were equally variable, though some definitely stick out more in memory than others. There’s no doubt about it, portaging a canoe and gear multiple times takes a huge amount of effort but the satisfaction of travelling around in a complete circuit with only human power is immeasurable. Here are a couple of items that we found to be useful for our trip on the Bowron Lakes Canoe Circuit in addition to all of our regular paddling gear. Affiliate links ahead, which means I receive a small percentage if you purchase anything through them at no extra cost to you. This helps support my website. Sayward Forest Canoe Circuit by Michel Gauthier. This excellent guidebook is a great read before and during the adventure. All of the campsites are described as well as recommended picnic spots. I enjoyed reading about the history of the area. Sayward Forest Canoe Route brochure by Sites and Trails BC. Download and print this for a helpful map and useful information about the route. Lightweight tarp – The perfect shelter for those Vancouver Island downpours. I wouldn’t go on any trip without one! Water treatment method – It is advisable to treat the water from any of the Sayward lakes before drinking. We personally prefer to use a filter system while padding and at camp, but we always carry some Aquatabs as a lightweight backup. Waterproof camera protection – You will definitely want your camera on the Sayward Canoe Route! We kept ours safe in a small Pelican case. Not only is it waterproof, the hard shell also protects our camera while packing and un-packing the canoe as well as during portages. For more gear recommendations and general wilderness trip advice, scroll down to the end of this post. 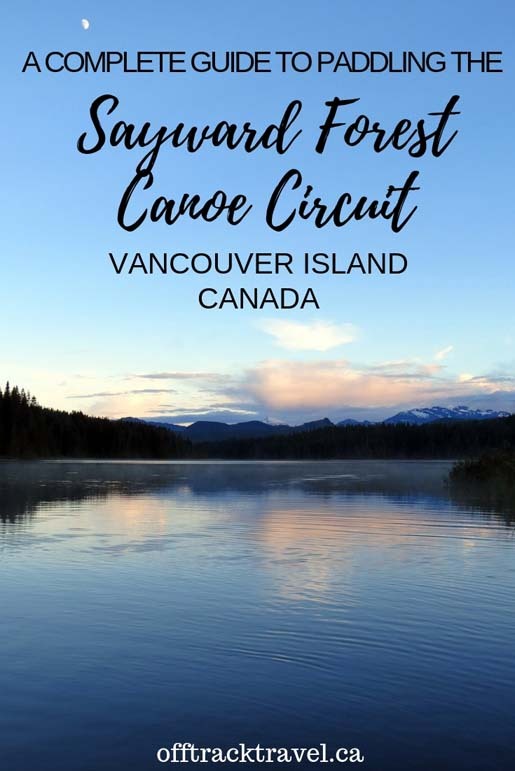 We spent a good amount of time contemplating the Sayward Circuit before we did it as we were fairly novice canoeists at the time. Sure, we had battled whitecaps and could maintain a pretty fast paddling speed on lakes, but we had never tried portaging and/or a multi-day multi-lake canoe trip before. The thought was a little intimidating. Despite these challenges, I would still wholeheartedly recommend the Sayward Forest Route to novice paddlers. Paddling the circuit immensely satisfying experience that we remember fondly today. It was also a great learning experience. Since our Sayward experience, we have confidently taken on two more canoe circuits (Powell Forest and Bowron), tried ocean paddling in Desolation Sound and explored the Yukon River. Before we set out on the circuit, I found it difficult to find an account by paddling novices or advice relating to novice canoeist concerns. So here are our thoughts on the Circuit as new canoeists, passing on tips that we think would have been helpful to us before our trip. It is possible to complete the Circuit in two days, with camping just one night. However, this trip plan requires two very long days of paddling (think 9am to 7pm) and good weather. Four days is the perfect length of time in my opinion as it allows for one bad weather or lazy day and shorter paddling/portaging days overall. Mohun Lake is by far the most popular place to start the circuit. Morton Lake Provincial Park is adjacent to Mohun Lake and has a parking lot. There is the presence of a Park Facility Operator in the nearby campsite during the main season (mid-May to late September). Most canoeists do start at Mohun Lake, but you can start pretty much anywhere depending on the season. 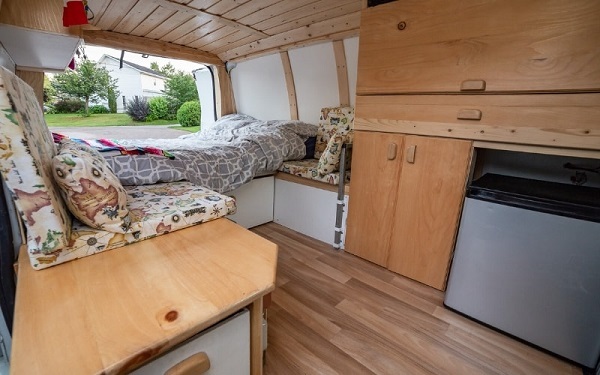 We had an older van and left nothing of value in it (for bears or humans! ), so we didn’t have any security concerns for leaving it unattended at one of the Rec Sites. If you do not have much wilerness camping experience, make sure you can put up a tarp shelter properly before you go. Sounds basic, but when it’s raining and you’ve been paddling and portaging for a while, you’ll want a dry camp as soon as you get on shore! It is also a good idea to practice portaging at home, especially if planning to overhead carry. We took way too much food, water and firewood that we didn’t end up needing. On similar trips, we now just take a bit of kindling (say, a handful) and rely on the wood we can find along the trails and lakes. For water, we use a portable filter that we can use either at camp or while paddling. With so many portages, I’d highly recommend going the dehydrated route to save food weight, with maybe a fresh meal for the first night. 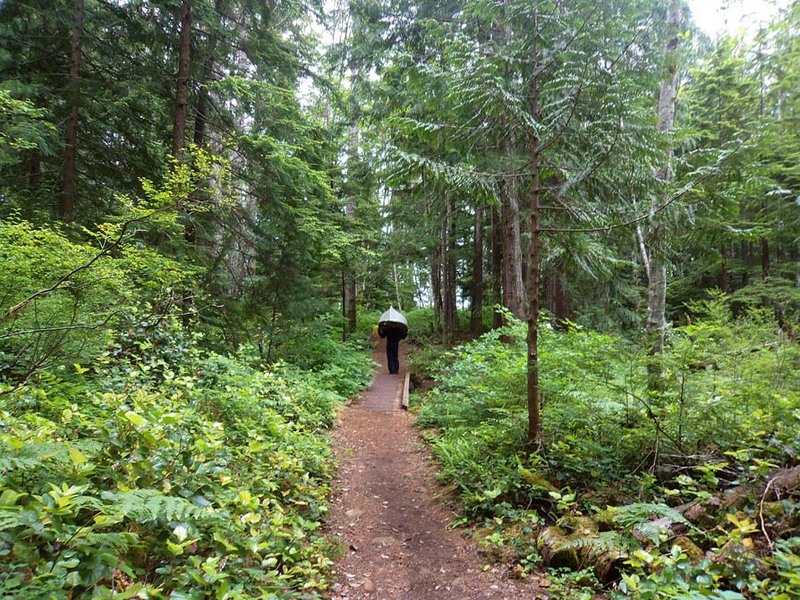 Due to ease of access and excellent camping opportunities, the Sayward Forest can be quite busy in summer. If you prefer solitude, start and end your trip during the week. If possible, go in June or September instead. SLOW DOWN!! Whymper Lake was one of my favourite lakes and it is the smallest on the circuit. It was such a lovely quiet little lake, covered in lily pads and not accessible by any road. The river between Brewster and Gray Lake was quite low on our visit, so we had to get out and walk the canoe down the current to avoid the rocks. It was pretty slippery underfoot and the current can be surprisingly fast. We had to walk the canoe maybe 100 metres before we could paddle again. After the portage at the bottom of Gray Lake, there is a really fun river section leading into Whymper Lake. There will be branches and plants blocking your way as you quickly move down the narrow river. This was one of my favourite parts of the whole circuit and it was over way too soon! We paddled against the wind on both Lower Campbell and Brewster. 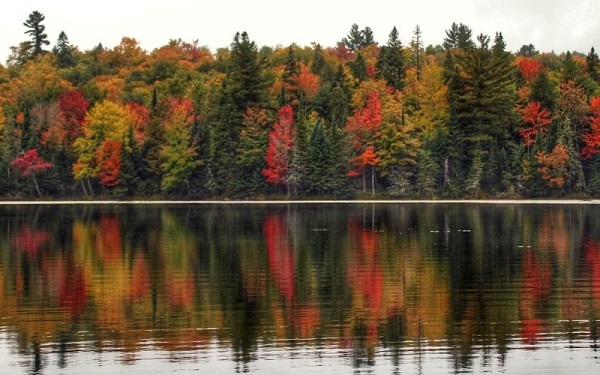 Be prepared for some strong canoeing across these lakes in case you’re as unlucky as us! The portages are relatively straightforward if you have a canoe cart. They are well marked, seemingly regularly maintained, quite wide and also fairly nice to look at. Jean Robert portaged our canoe the old fashioned way, and hence we found the portages tough in places. If using a canoe cart, you should have few problems. 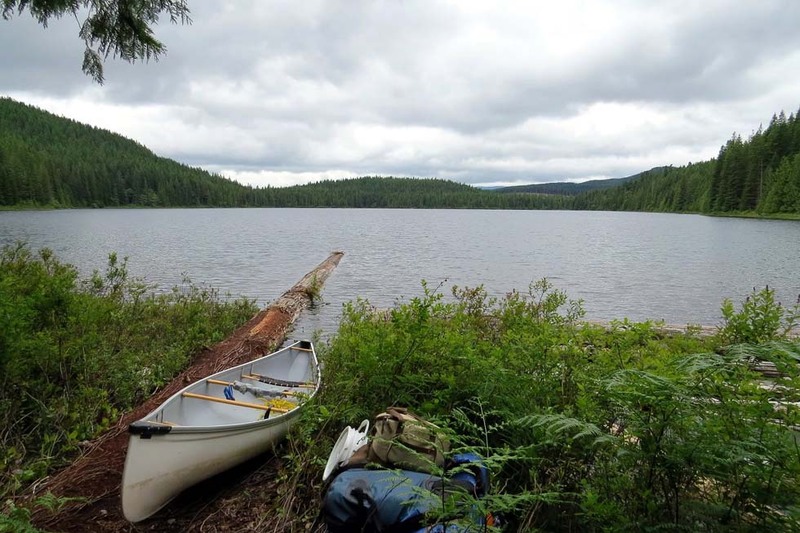 The 1.1km portage (Lower Campbell Lake to Gosling Lake) is difficult whichever way you do it as it is mostly uphill and on a logging road. 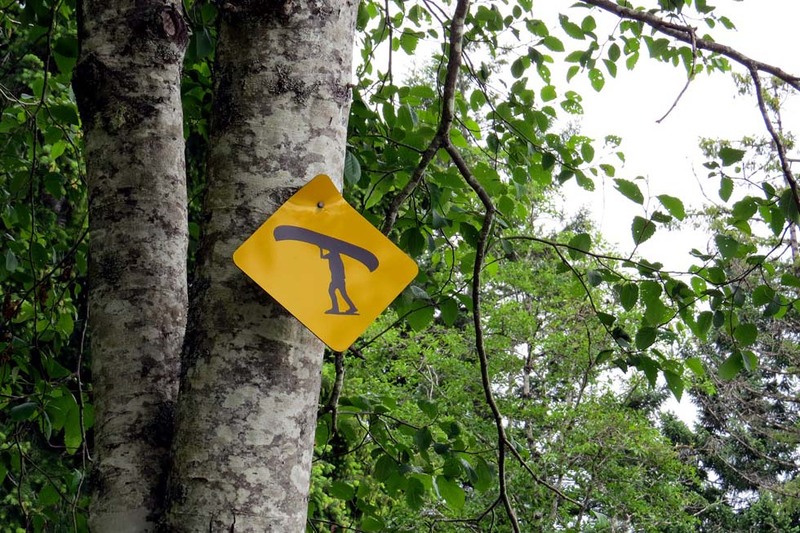 If you are carrying your canoe then note that there are only two rests on this portage. If you are using a cart, I would not bother using it between Higgins and Lawier Lakes (0.4km), as there are some steep rocky sections and lots of tree roots. There are plenty of canoe rests on this portage though. The 0.8km portage between Twin Lakes and Amor Lake is downhill and fairly steep the whole way; such a relief when we found this out! The longest portage (2.2km from Amor to Brewster) was a lot easier than we had feared; it is very flat after the first hill and has lots of canoe rests. Some people walk down the logging road for a section of this portage. If carrying the canoe overhead, keep in mind that it takes more organisation at the start and end of each portage, which makes progress slower. 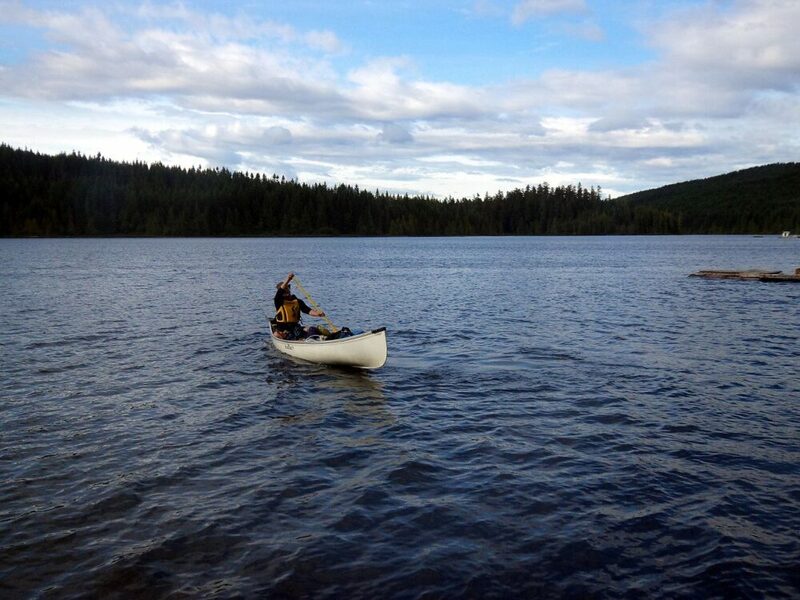 Consequently, the section between Gosling Lake (two small lakes, three short portages) takes more time and effort than the equivalent paddling distance. One comment from Jean Robert about portaging with the canoe on his head was that he didn’t get to see much of the trails. Some of the put-ins and take-outs can be muddy, dependent on the season and weather. Be sure to wear suitable shoes. 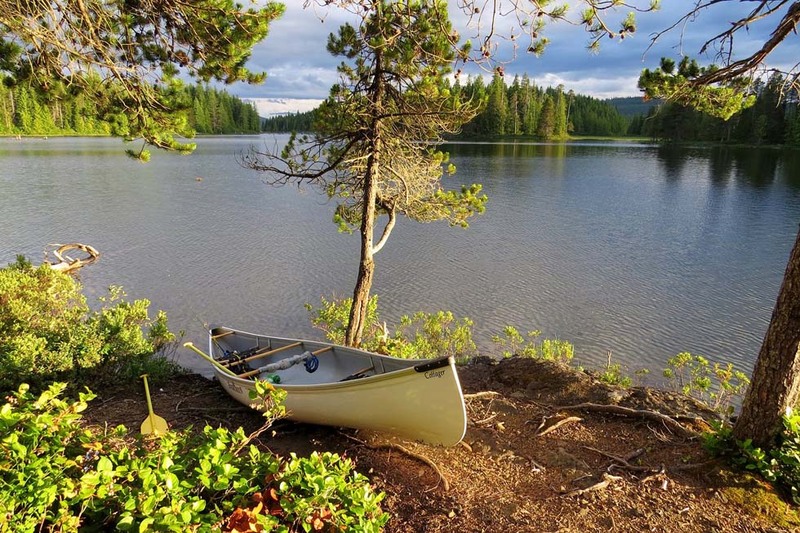 Paddlers have a few different types of campsites to choose from on the circuit. Rustic campsites are accessed only by water and have, at a minimum, an outhouse. Although not formally developed, there are level areas suitable for tents. There may also be wooden benches and tables created by other paddlers. 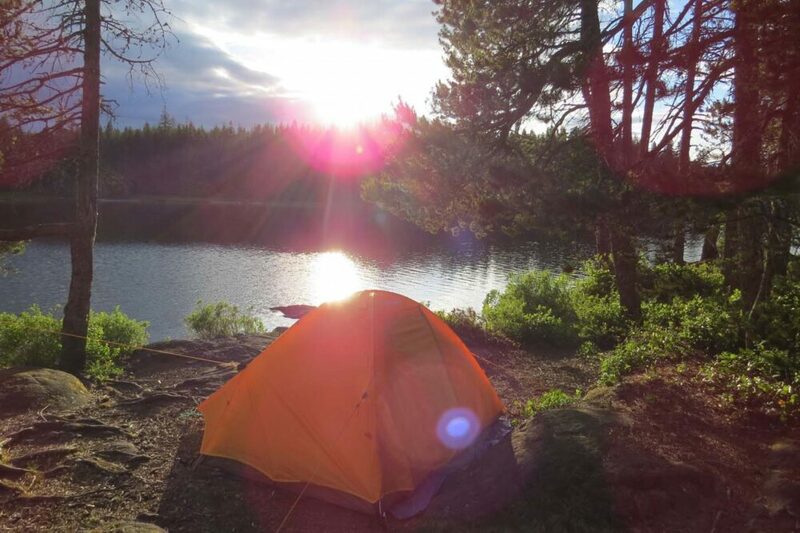 Developed campsites are those only accessible by water and are more established than the rustic campsites. Mr Canoehead, for example, has picnic tables. Recreational Sites are road accessible campsites with outhouses, fire pits and picnic tables. Some have caretakers and a nightly fee during the main season. Private campgrounds are the most expensive option but will have the most facilities (and hence popular with RV users). Rec Sites are popular with RVs and hence are more likely to be busy, especially in the summer. The Sayward Forest is visited by ATV owners who also often camp at Rec Sites. 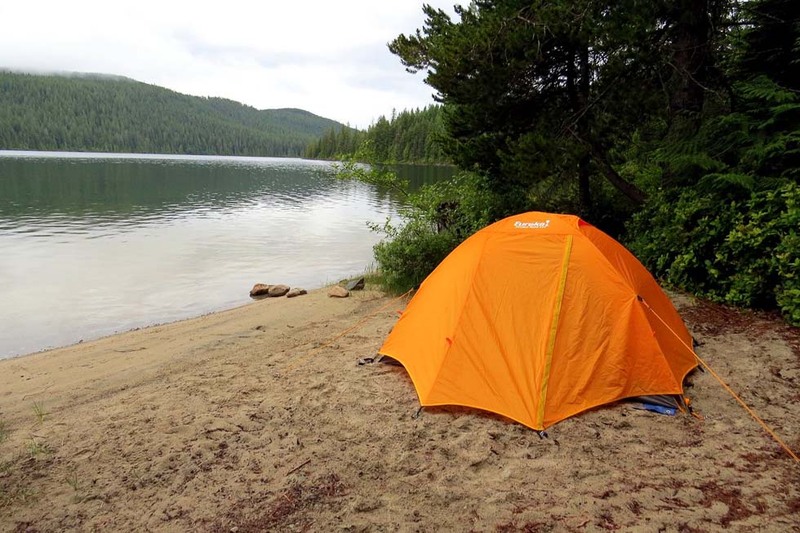 Campsites that are only accessible by water are generally better suited to tents. We spent our first night at Brittany Bay Rec Site on Gray Lake and it was awkward to find a clear level site for the tent. Amor Lake is a wonderful place to camp, I’d definitely recommend staying here if you can. 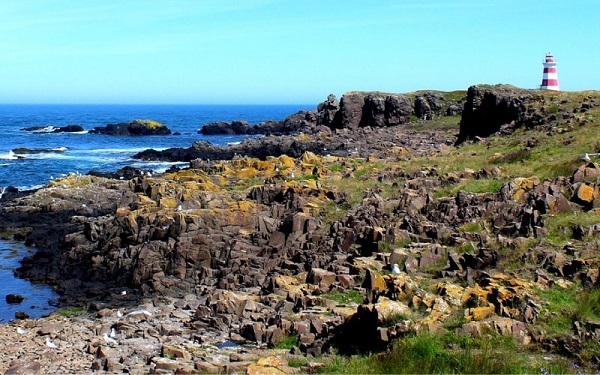 It has an interesting shoreline, sandy beaches and quite a few lovely water accessible only campsites. Amor Lake is also harder to access by road. We camped at the rustic campsite on the western shore. 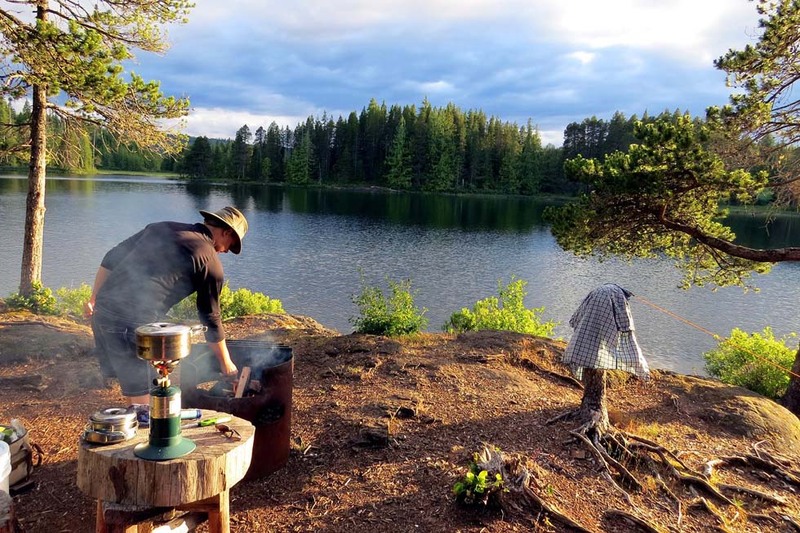 Our other favourite campsites include (some we stayed at, some we didn’t): the developed campsite at the southern end of Fry Lake, the rustic campsite at the eastern edge of Brewster Lake, the rustic island campsites on Goose Lake (northern Mohun Lake). 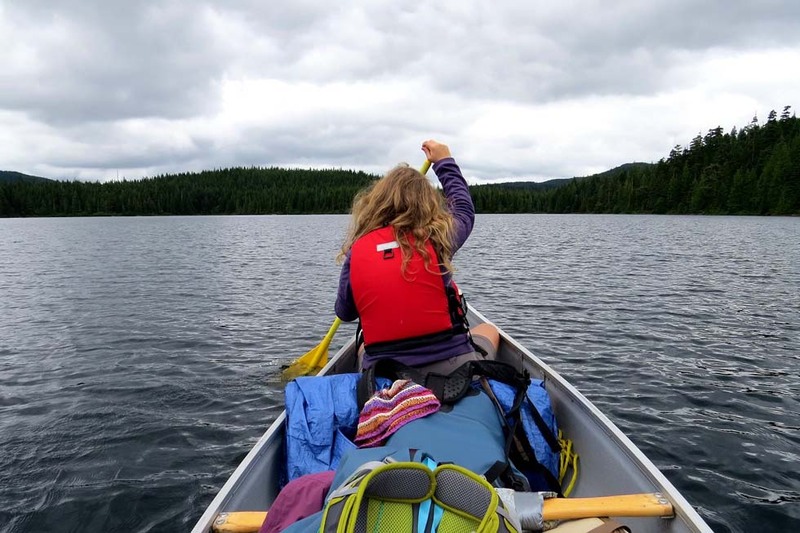 Work out a system to make sure your camera is accessible and safe from water BEFORE you go – we often got back into the canoe after portages and had forgotten to put the camera in a good place to reach it again while paddling. Don’t underestimate how long it takes to portage. 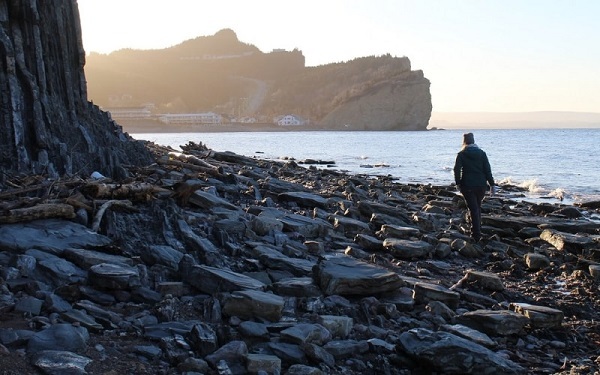 Though the distance on the map may seem short, portaging is more than just walking the trail. You have to unpack the canoe, organise your gear, transport it and the canoe along the trail and then repack at the other end. Depending on the amount of gear you have, you may need to portage twice. If unsure how to plan your trip, consider timing yourself paddling a certain distance so you have an idea of average paddling speed. This may stop you from rushing when not needing to. Wind can pick up quickly on the larger lakes such as Lower Campbell Lake, Mohun Lake and Brewster Lake. Try to paddle these early and stay close to shore. Be aware that some of the lakes are the result of dams. Fry Lake, in particular, has lots of deadheads (submerged logs or tree stumps). Paddle carefully! If you liked this post, PIN or save it for future reference with the above photo! Hi there! I am hoping to do this route next week. Wondering what you did for food storage…are there bear cache’s at the sites, or did you hang the food? Thank in advance for your help! There are no bear caches on the Sayward Route – at least, there wasn’t in 2013 and I can’t imagine any would have been added. We hung all of our food. Nowadays, we have a USack bag which is very difficult for bears and vermin to get into, but at the time we just used a large food bucket. Thx for the info. Are there any kayakers out there who did all or part of the route? I am nervous about the portaging. Any hints on that aspect? Much enjoyed reading about your Quadra Island and Sayward trips. My wife and I and another couple are planning a week-long canoe trip in August. Other summers we have had more time and did the Stikine, Columbia, Bowron Lakes etc. but this time we are looking to do something closer to home (Victoria and Gabriola). We thought we might canoe for four or five days and then take the U-chuk to Kyuquot for our last couple days. Which of the two trips would you recommend? 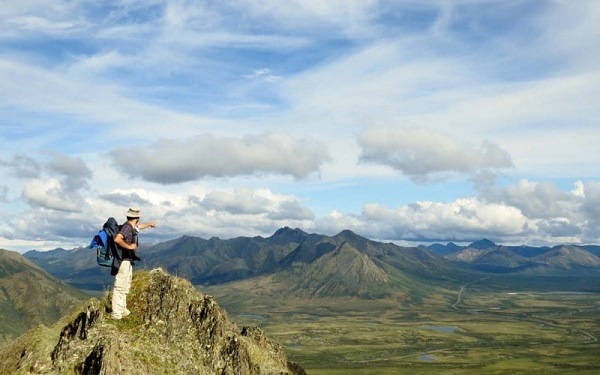 We love beautiful places and don’t mind a little hardship getting to them (but not too much!) For Sayward portages, do you recommend canoe carts with large wheels (the kind used on Bowron lakes)? Thanks for your comment! 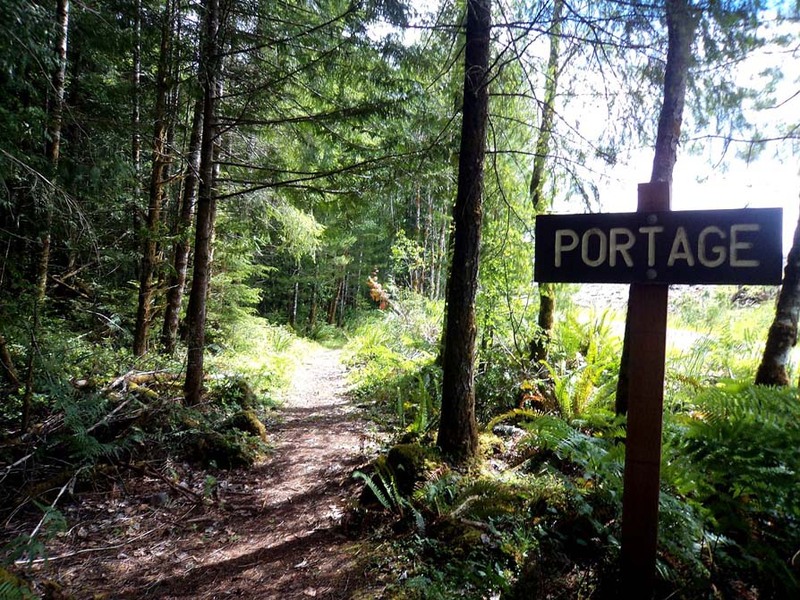 Sayward Forest vs. Main Lake route….hmmm, they are different experiences. Quadra is a bit more of a ‘home base’ kind of trip (well, at least the way we did it), while Sayward is a far busier/adventurous kind of trip. Of course, you could adapt either trip e.g. stay in more than one campsite within the Main Lake area or stay at one lake for 2/3 nights on the Sayward route. Main Lake is a little quieter overall since you need a boat to get in there, while most of the campsites on Sayward are vehicle accessible. So it really depends what you’re looking for and your camping style. I would definitely recommend staying on Amor Lake on the Sayward route if you’re into quieter & more secluded places. We’ve heard awesome things about the U-Chuck! I’m sure you’ll have a wonderful time whatever you choose to do. The one group of people we met on the Sayward route were using a canoe cart with large wheels (the Bowron type) and they were having no issues. There is only one portage which you can’t really use a cart due to tree routes and boulders. Thanks, Gemma, for this information. I think this year it will be Quadra Island, 2 or three nights on Main Lake and other lakes in the area, and then paddle in the Surge Narrows and the Octopus Island group for a few more nights before heading to Kyuquot for the last couple nights. Sounds like an amazing trip David! Hope you have a fantastic time! Hi Gemma, in your article you state that the recommended direction is clockwise but all other sites say the opposite ie. do it in a counter clockwise direction. The official map also shows arrows to do it counterclockwise. Could you please clarify? Many thanks for your excellent article. Much appreciate the info. We are planning to leave early next week to spend 4 days on this route. Big typo on my part (must have been when I updated this post a few weeks ago) – you have to complete the circuit in a counter clockwise direction. This is due to the short river/creek sections. I’ve just fixed this. Have a fabulous time! I am thinking about doing this trip with a group of 10-12 people next summer. I would be coming from WA State. I could bring my canoe and rowing wherry with me on a small trailer over the ferry, but I will need another canoe or two depending. Any recommendation on an outfitter who could help with canoe rentals, etc.? Also, do you recommend canoe carts for the portages on this route? For a group that big, I would really try and minimise the number of tents. I think you should also be prepared to split the group up for camping. Finally, I would avoid the island campsites with so many people as they are quite delicate environments.